In answer to your questions 1. The Holy Synod decreed some years ago now that between Ascension and Penetecost there is a procession every day in the altar only. I have never seen it documented how many times or should be and most do it 3 times but Ibrahim Ayad on his recording says 7 times. 2. The Synaxarium is not read until after Penetecost. Hey just wondering what you guys did this year on the Sunday (today) between Ascension and Pentecost in terms of the procession. Our church decided on 3 in the altar only. Anyone do 7 in the altar? Also, I am not aware of the contemplations on why specifically 3 or 7 for this period. If anyone has any to share, please do. I was wondering if someone like Ramez can comment on what, if any research, is done on the ancient practice during these days after the Feast of the Ascension. One of our deacons stated that the holy synod has it as 7 cycles in the altar only from Ascension to Pentecost with the exception of the feast of Ascension, which is 3 altar cycles, 3 church cycles, and 1 final altar cycle. I wasn't sure if that holy synod statement was accurate. The other confusion is with which icon to carry. In Anba Mattaous' "The Spirituality of the Rites of the Holy Liturgy in the Coptic Orthodox Church," it says to use the Ascension icon for the Feast of Ascension procession, but use the Resurrection icon for the 10 days until Pentecost. It also says to use the Resurrection icon on the feast of Pentecost. I know in my church we just carry both the resurrection and ascension icons from the feast of ascension to pentecost. I wouldn't be surprised if we carry all 3 icons on pentecost (resurrection icon, ascension icon, pentecost icon). Yes. We carry both icons because you are always celebrating the Resurrection first, then the Ascension....you say the Resurrection doxology first, then the Ascension. On the feast of the Ascension you carry both icons as the procession is around the church as well. However during the period between Ascension to Pentecost the procession (which is to be considered a modern practice) includes the hymns of the Ascension only i.e. Afrek etve and Christos analiepsis and only 3 times around the altar with the Ascension icon. I am not sure why Muallim Ibrahim Ayad said seven times on his recording I can only assume he was referring to the ordinary full procession which is seven (three altar, three church and then one altar). As for the final procession in Pentecost I have seen conflicting opinions, and yes they are opinions. The original Dalal book only mentions the icon of the Resurrection but the majority of other books say all three icons as a summary of the feasts of the Resurrection period or Pentecost Period. This makes more sense to me as even the hymns on this final procession all refer to the Resurrection, Ascension and Descent of the Holy Spirit. Drew, books say that you must say ekhrestos anisti after afrek etfe and before ekhrestos anilipsees. Taking it further with o nim nai and ya kolo sofoof is.... acceptable to me if you have the time. C Ibrahim said seven because up to a couple of years, it was seven. Even Anba Mettaus dalal says to do 7. I have a strange question. Before the Ascension, I understand that sometimes the congregation used to join the procession, and might have even went around the Church outside. When it comes to only processing around the altar, was there any possibility that the congregation would join? What about chanters, readers, and subdeacons? In the old canons, only deacons, priests, and bishops were allowed in the altar. So I'm just wondering about this altar procession. @minasoliman...the answer is no. No one enters the altar except with a tonia. Also, the procession is NOT a canon....it's a rite that can change as the Synod sees fit. Actually, even canons can be changed with the Synods approval. Mina which procession are you referring to? the rite of the procession during the Ascension to Pentecost is new and was always three times in the altar with Ascension hymns only. Saying Christos anesti is only on the feast of Ascension as the procession is still around the church but not during the period after that. After Ascension there are no Resurrection hymns i.e. Kata nikhorus al hegab, ya kol assufouf and Christos anesti until the final procession in Matins on Pentecost. I have heard a few theories about the Resurrection procession and who partakes of it and I no longer know what is correct. I read that traditionally the catechumens who had recently been baptised used to partake in the first procession of Saturday of Light after Psalm 151 and the Resurrection procession but this does not work with the way we do the Resurrection procession compared to other Orthodox Churches. The Greeks and Russians for example do the procession with whole congregation carrying candles entering into an unlit church as a symbol of the tomb's darkness turning into light. This makes sense as the congragation would enter and stand in their places while only clergy continue to the altar to continue the service. However, our procession is very much in the middle of the Liturgy and would seem awkward to involve the congragtion as well as impractical. I have often thought that our Resurrection enactment and Procession would be better placed at the beginning of Matins but that is another discussion altogether. The procession around the altar during Ascension to Pentecost only came about within the last 15 - 20 years so there would never have been a need for the congregation to enter into the Altar and that would not have happened. "The procession around the altar during Ascension to Pentecost only came about within the last 15 - 20 years so there would never have been a need for the congregation to enter into the Altar and that would not have happened." Ah, okay...that is what I wanted to know. I had no idea what you meant by "recent" until you quantified it. I thought "recent" might have been a few hundred years or something. Is there any documentation of centuries past on the idea of a "procession"? - On Ascension day, a full procession with resurrection and Ascension hymns. - On days between Ascension and Pentecost, no procession, so no Ekhrestos (you just say Afrek and Agios after). - On the one Sunday between Ascension and Pentecost, one procession, 3 rounds around the altar with the same hymns we say on the Ascension. The main change is whatever took place on sunday, took place on the other days too in between. Resurrection still proceeded the Ascension. Even the Ascension doxology started as a continuation of something else, the Resurrection doxology. The procession around the altar during Ascension to Pentecost only came about within the last 15 - 20 years so there would never have been a need for the congregation to enter into the Altar and that would not have happened. I don't think we can go this far and say "it has been developed within the last 15-20 years"...I am in my 20s and we have been doing a procession for as long as i remember....so there goes your 15 years. I have a friend who has an old version of nahdet el-kanayes khidmit shamas, and i think in church (I'll check it int he next couple of hours)...it's definitely older than me and i'll check for a mention of the procession in there. Mina let me tell you that I'm in my 30's and there were no processions between Ascension and Pentecost when I was young hence why definitely not more than 20 years. This period has always been in dispute and what you say about the Sunday in between is wrong. The original dalal and I mean original not Anba Mettaous has no mention of a procession during this period and there are numerous sources that agree with this as Christ has Ascended and therefore the procession around the church no longer made sense symbolically. Now the confusion came about by the Nahdet El Kanaes service book which says there is a procession only on the Sunday in between as Sunday is the day of Resurrection. Firstly note it never said in the altar only and secondly during the Pentecostal period all days are equal in terms of rituals and treated like the Resurrection day and not just the Sundays. 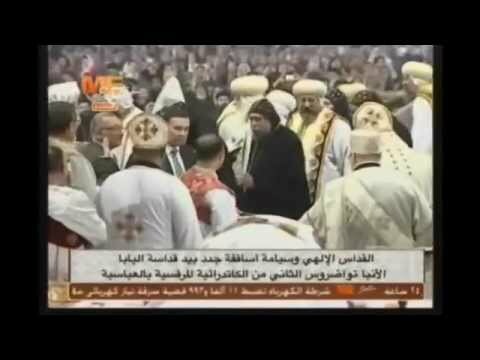 So some churches used to do this procession and many more particularly in Cairo did not. Anba Mettaous then started to teach that there should a procession only in the altar 3 times on the Sunday in between. This was then developed by Anba Benyameen who argued that as all days were equal the procession should be every day during the period. I have just checked the Holy Synod decisions and it was decreed on the 26th May 2007 (18 years ago) that there is to be a procession in the altar everyday from Ascension to Pentecost three times with both the icons of the Resurrection and Ascension. @drewhalim do you mean 8? @ophadece definitely 8 not 18! Thanks for pointing that out. @Drew...i believe you are in the states...give me a year that your church was established and started doing this...and if possible those who started "having disputes on this procession"....even though, atleast in my opinions, whatever we do here in the diaspora means nothing since our source is always the motherland, Egypt. One more thing, what "original dalal" are you talking about exactly?! I went to church, and forgot to check the khidmit shamas :-)...I should be in texas monastery tomorrow so I'll have more books to check there. I'm actually in the UK and our church was established in 1976, however until a few years ago I spent every summer in Cairo, part of the motherland you refer to, learning from cantors and still in regular contact with them. I also know that even though the Synod decreed in 2007 many churches in Cairo and abroad still did not follow suit for a number of years. I will get you the details of the original dalal I refer to and the year of print next Sunday when I'm at church. I know too well what Nahdet El Kanaes and Muallim Farag's service books say. Also the dalal that many refer to as authored by Anba Mettaous I think you will find is by a monk of the Syrian monastery and "revised" by Anba Mettaous as were many other books, some which conflict. I'll wait for that information. And I am with you on Anba Mettaous book...but despite what his grace is saying (or the many people that write books and he edits), we do whatever the Synod said...churches that don't, must carry the responsibility of not doing so the sin of causing confusion among the people that do care about the rites of the Church. I'm not sure what your last post means but earlier you claimed that the practice of a procession between Ascension and Pentecost existed 15+ years and I was only pointing out that the Synod only decreed on this matter officially in 2007 so only 8 years ago. As we all know and have experienced it can take a long time for Synod decisions to become public knowledge and accepted, unfortunately. I will post the book details soon. Thanks for that piece of information although despite sounding bad I wouldn't have been gravely surprised if the decree came out in 97! Anyway the last few years saw many decrees because we are becoming more and more fed up with the practice of our fathers. And their teachings don't suit us in today's world. At the end of the day they also changed the practices of their fathers for whatever reasons.. I seek a day when the writings of Abouna Athanasius al Maqari be translated soon. Either that, or I really have to brush up on my Arabic. I was just alluding to the confusion of the rite changes. Abouna Athanasius Al Maqari I understand is a treasure trove for understanding the history of our Coptic liturgical practices, so I'm just sympathizing with you and sharing my wishes that I may be able to read his writings some day. As per Fr. Shenouda Maher he has manuscripts that state there should be a full procession every day of the 50s and it doesn't change. That makes a lot more sense than what goes on now.